Over labor day weekend I took my chances with TSA flying from California to San Antonio, Texas for the First Milblog Family Reunion. I got to spend time with some good friends and meet some new friends at the Soldier's Angels support center. There were several bloggers present, yet the event was still small and intimate. There was live music, discussions on Post Traumatic Stress and reintegration. The event was educational and just down right fun. The most memorable moment was when the Valour-IT program provided Wounded Warriors with lap tops. I had the honor of presenting a lap top and speaking with several recipients. One of the recipients, Christopher Sullivan, a quadriplegic couldn't make it to the Soldier's Angels support center, so his mom Suzanne, his brother, and sister who had moved from California to San Antonio, Texas to be with Christopher during his recovery accepted the lap top. The Sullivan family is a strong, courageous family. I am grateful I was able to meet them, and hope to one day meet Christopher. 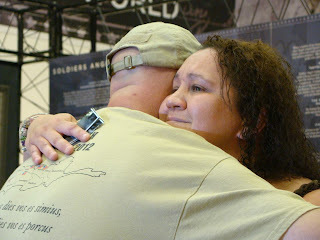 Meeting the Sullivan's and the other Wounded Warriors enforces why Valour-IT is so important. Valour-IT changes lives. It provides opportunities. Just ask the Sullivan Family.